When deciding to use a rooting hormone to propagate a cutting, be sure that you are attempting your rooting project at the right time of the year. Use a non-flowering cutting. If you want to propagate your roses, be sure to use rose canes that have new succulent growth. 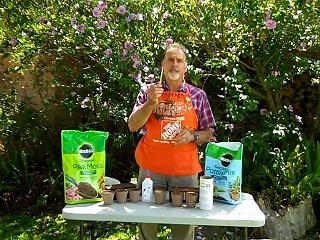 Use a light potting soil that contains perlite and other organic soil. 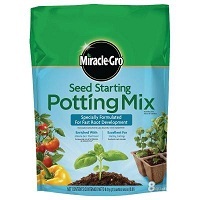 It is OK if it has a little fertilizer in the soil like Miracle Gro Potting Soil or Miracle Gro Seed Starter. 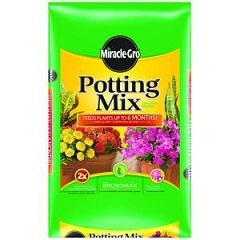 Fill your growing pot all the way to the top but DO NOT pack the soil in. You want the mixture to be light and airy. it. Make sure the section that you choose is at least as thick as a No.2 pencil. 1. Choose a section of the rose about 6 inches from the tip of the rose cane Remove any blossoms from your rose cutting as a rose will not produce roots if it puts its energy into flowering. Choose one that is about as thick as a pencil. 2. Cut the rose below the point where a leaf stem emerges. This is called a node. It is the leaf node where the stem will produce its roots. Be sure to have about three nodes between the point where you made your cutting and the tip of the cutting. To help your cutting root you can also make slits at the bottom of the cutting to help encourage root growth. 3. 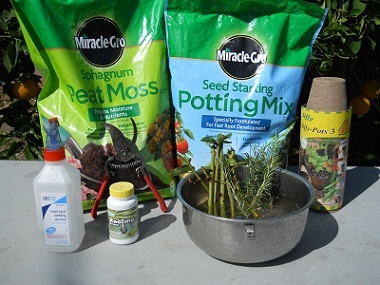 Next, take your peat pot and fill it will a peat moss. Wet the peat moss until I is damp. 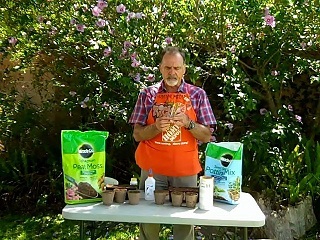 Or you can use a good potting mix in 3-4 inch plastic pots. Strip the leaves from the nodes of the cutting along the lower 2/3’s of the stem but leave the top three to five leaves on the cane. Dip the end of the cutting in the rooting hormone. 4. Insert your cutting halfway into the peat moss. Use a pencil to make the hole. Cover your plant and container with a plastic bag, securing the bag with a rubber band. The key thing to remember is to keep this mixture damp and in a brightly lighted area. The plastic bag works well to keep the humidity up around the stem of the plant. 5. Place your containers in a brightly lighted location out of the direct sunlight. Water the soil anytime the soil feels dry. After about 3-5 weeks remove the bag when the rose canes have produced roots. Note that it might take as long as 8 weeks for your rose cutting to root. Be patient and keep your planting medium damp. One thing that you will want to keep in mind when you are growing your new rose cuttings. Most of the Rose bushes are grafted. A heartier rootstock is used to help the rose grafted to it better with stand the hotter and the colder climates. When you start s rose from a cutting, be aware that it may not be as robust as one that is grafted to a stronger root stock. Your “New” rose may not be as strong as its grafted cousin. Be sure to share your experience of making a new plant from a cutting.